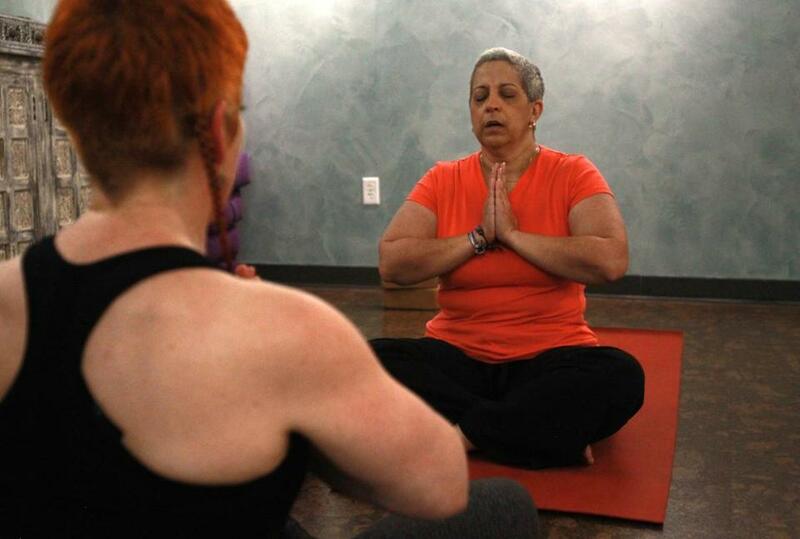 Myrna Gomez-Soto participates in a yoga session for women in breast cancer treatment at Stil Studio in Dedham. Kristin Sinclair knew exactly what she was going to do when she recovered from breast cancer. During her odyssey, which started when she was 27 with a lump that seemed too fast-growing and painful to be cancer, she took private yoga classes to build her strength and range of motion. The classes, provided for free by a local yoga instructor, ended up giving her much more: peace of mind, the chance to stop being a patient for an hour, a goal. When her treatment ended, she vowed, she would provide the same care to other women touched by the disease. Sinclair began training to become a certified yoga instructor. But midway through, she learned that her cancer had metastasized. 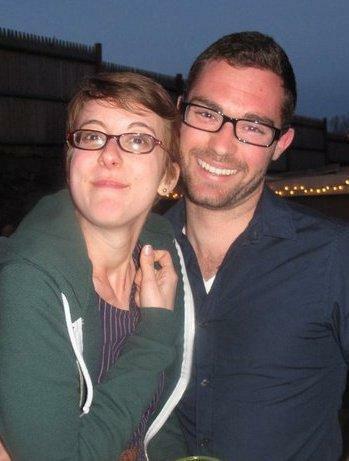 She died in 2013, at 28. The husband she left behind, a young lawyer named DJ Arnold, wasn’t about to let her dream go. A year after losing Kristin, he set in motion her plan to provide free, one-on-one yoga and meditation classes to women with a history of breast cancer. The nonprofit bodhi & mind yoga has since worked with 52 women from Greater Boston and trained 43 instructors to address the particular needs of breast cancer patients. Numerous studies have shown that yoga can alleviate anxiety and depression. But it can also provide specific benefits to breast cancer patients, according to three studies recently published in the Journal of Clinical Oncology. Among the findings: regular yoga practice reduces inflammation and fatigue, helps with well-being during radiation treatment, and improves sleep quality while reducing sleep medication use. Kristin Sinclair, with DJ Arnold, was training to become a certified yoga instructor. “Yoga is a great form of exercise for breast cancer patients, because it has been shown to be safe and it has been demonstrated to improve outcomes,” says Dr. Elizabeth K. O’Donnell, an oncologist at Massachusetts General Hospital’s Cancer Center. For women who have used bodhi & mind’s services, the immediate effects provide plenty of value. Myrna Gomez-Soto of Hyde Park had stopped cycling, gardening, and kayaking while undergoing radiation and reconstructive surgeries. Her oncologist recommended yoga to get her moving again. It worked. “It’s helped me to become more aware of my body in general. My energy and stamina have increased,” she says. In a warm, pale blue room at Stil Studio in Dedham on a recent evening, yoga instructor Karen McPhillips guided Gomez-Soto through a sequence of poses. The women laughed often, and during the final meditation, McPhillips gently massaged her student’s limbs. “The human touch, regardless of what’s happening, is super important to healing,” says McPhillips, whose mother and aunts are breast cancer survivors. Gomez-Soto can attest to that. “Every time I finish, I’m, like, Now I can take on the world,” she says. Susie Hynds, 39, of Newton, another bodhi & mind client, especially appreciated the physical elements of yoga. Hynds worked out in a gym five times a week before her breast cancer diagnosis. After treatment, she had trouble with routine movement. Kristin Sinclair wanted to use the word bodhi, which means enlightened one, in the program’s title. Though many participants are drawn to the program by their physical needs, they seem to develop insight as a side benefit. Rosalie Weener of Brookline says the sessions have given her “the tools for a more peaceful, accepting life. Such worries are common, says Patricia Arcari, program manager for meditation and mindfulness at Dana-Farber. While other yoga and meditation programs for cancer patients exist in the Boston area, particularly at cancer treatment centers, private classes allow for individualization that can be especially helpful for people going through different stages of medical treatment and healing. But private classes can be expensive. “Our goal specifically is to work with women who otherwise wouldn’t be able to access this,” Arnold says. Those who can afford the program are also welcome, but are encouraged to make donations. Each 16-week course costs about $800, including instructor salaries, studio rental fees, and yoga supplies for home sessions. Funding for the program comes from individual donations and, this year, a $10,000 Lenny Zakim Fund grant. Arnold hopes to bring the program to more Massachusetts women, offer group classes, and someday open a studio. He’s launched a small pilot program in Vermont. The instructors, who are already certified to teach yoga, attend a two-day training that includes an oncologist or breast surgeon discussing the physiology and common side effects of breast cancer treatment. They learn how to modify traditional poses for women who are stiff or numb after surgery, or who need to keep their hands away from their faces to avoid germs. Instructors also study the importance of catering to however a woman feels on a particular day. If that means simply sitting and meditating, the session is hardly wasted, Arnold says. For Kristin, meditation may have been the most important part of her yoga experience. “The meditative process changed the way she viewed what was happening to her,” he says. After she learned her cancer had spread, Kristin still felt strong enough to take a walk to the Emerald Necklace greenway. As she lay on the grass and meditated, she realized that no matter what happened, everything would be OK.
“She carried that with her while she was dying,” Arnold says. Susan Kushner Resnick can be reached at suekush@comcast.net.